Team Fortress 2 overcomes a saturated gaming market by using savvy marketing techniques. Marketing includes detailed information about each character. Online comic books expand its reach, peaking interest in the multi-player shooting game with players worldwide. Free playing promotions entice those interested in saving a buck while immersing in the unique stories and customizable characters. Two teams of nine players each battle in a variety of game modes to determine which team is victorious. The team’s characters are mercenaries hired by dueling brothers. In the video game, one brother is bent on destroying his brother’s company assets while the other protects his property. Each mercenary carries a primary, secondary, and melee weapon. With more than 100 maps, unique abilities for the characters, and detailed statistics on each player, the game is widely acclaimed. 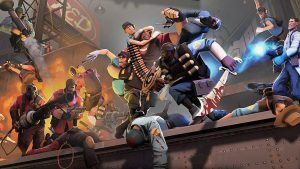 In 2007, the game’s developer Valve released 10 videos to promote individual characters in Team Fortress. These detailed video animations illustrate the characters in action, including combat abilities. In addition, they released a film in 2014 that explored the characters and took audiences deep into the Team Fortress world. The comic book series for Team Fortress 2 explores the fictional history which includes bickering brothers who have each found ways to maintain life during the contentious conflict between them. Limited-issue paraphernalia such as weapons and hats are given to gamers who pre-order or make breakthrough accomplishments in other games available on Steam, a platform for online game distribution. Team Fortress 2 is available on Xbox 360, Microsoft Windows, and PlayStation. It’s the ultimate game of survival, pitting man against man in a fight to the death. Newbies often learn the game in trial by fire. Just jump into the action. Each game allows up to 32 players. By paying attention to your team and enemies, you can learn to play like a pro gamer.